Sparklike Oy will be presented at this year's Glasstech Asia trade fair in Singapore by Ian Duckworth, Director at Asia Point Co. Ltd. Mr. Duckworth has been involved in Glass and Fenestration industry for nearly 30 years and set up his own company to represent a number of international companies in South East Asia. We are one of the companies Ian Duckworth has been promoting to companies in glass and fenestration markets in South East Asia. To that end, Mr. Duckworth will be at Glasstech Asia 2017 exhibition, with Sparklike Handheld™ device. Being reputed as the 'Glass Hub of South East Asia', this 15th International glass products, glass manufacturing, glass processing and glass materials exhibition will be a good platform to showcase our patented and proprietary technology that allow non-destructive insulating gas fill analysis for standard double glazed insulating glass units. 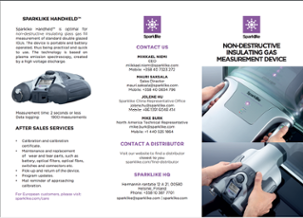 During the trade fair, Sparklike Handheld™ device is available for non-destructive argon testing at K Pavillion on Stand H2, which is Regalead Ltd stand. Sparklike Handheld™ device is portable and battery operated, thus being practical and quick to use with a measurement time of 2 seconds. Technology is based on plasma emission spectroscopy, where a high voltage spark is launched in the insulating glass unit's cavity causing a light emission which is observed and analyzed further.